@ Midnight Runner: Thanks, man! I do enjoy setting up that group pictures. @ Auggs: I have to be a bit of a smartass here, buddy: Technically speaking, there were some 28mm AdMech models available before Gruss (they can be seen here, courtesy of the ever-inspirational Dave Taylor), but those were limited to the Skullz-programme. And there might have been an Admech model or two in the Rogue Trader days as well? But anyway, yeah, for most of us, Gruss basically nailed down what a Tech-Priest should look like. In case anyone's wondering, this is half of one of the old 54mm Inquisitor models that GW released alongside the original game back in the late 90s. The character in question was Delphan Gruss, a Magos explorator of the Adeptus Mechanicus, basically the only AdMech model freely available back then, long before the AdMech became a playable 40k faction. Also: Dave Taylor's minis came out in the early zeros, while Gruss came out in the late nineties - so Gruss was released earlier than his. Seriously though: HOW did I miss the big guy in the back? He's fantastic! Edited by Augustus b'Raass, 11 January 2019 - 09:26 PM. 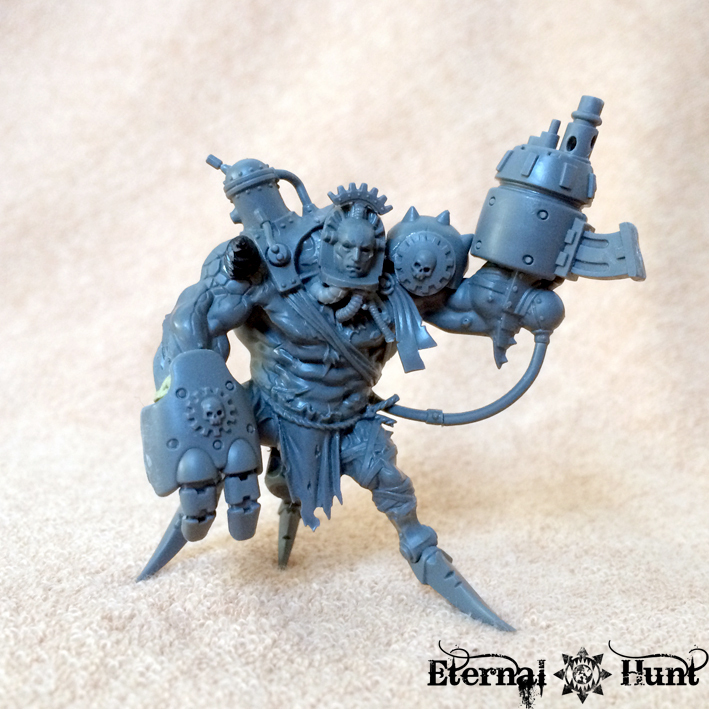 To be fair, I said "the first readily available" AdMech models -- but you seem to be right about Gruss preceding the skullz Tech-Priests (even if the latter do have quite a Rogue Trader era look). 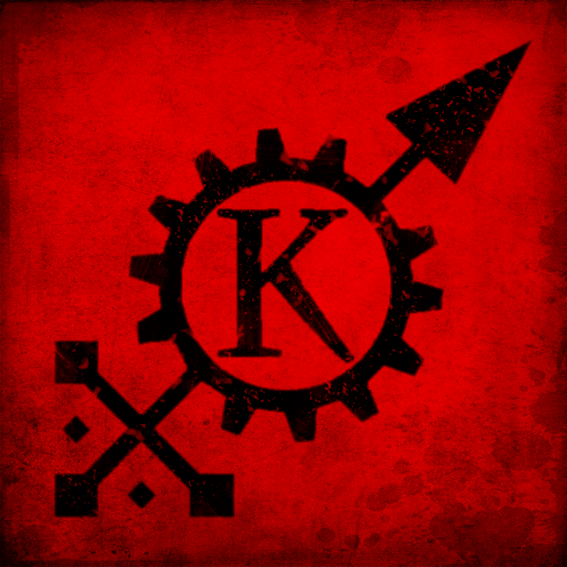 Korhold is the Velsen Sector's resident enclave of the Adeptus Mechanicus. The name serves as a designation for both the cluster of stars forming the Tech-Priests' domain and the actual forgeworld turning at the centre of it, Korhold Ultima. Following an attack by the fallen Magos Amnon Helix that ultimately resulted in the death of Korhold's Magos Intendant, Magos Domina Calista Syntax, fifty years ago, the Tech-Priests of Korhold have become even more suspicious and paranoid than the rest of their secretive order. As a result, the Magi of Korhold refuse to ever let their domain be ruled by one Magos alone, lest the same kind cataclysm befall them again. 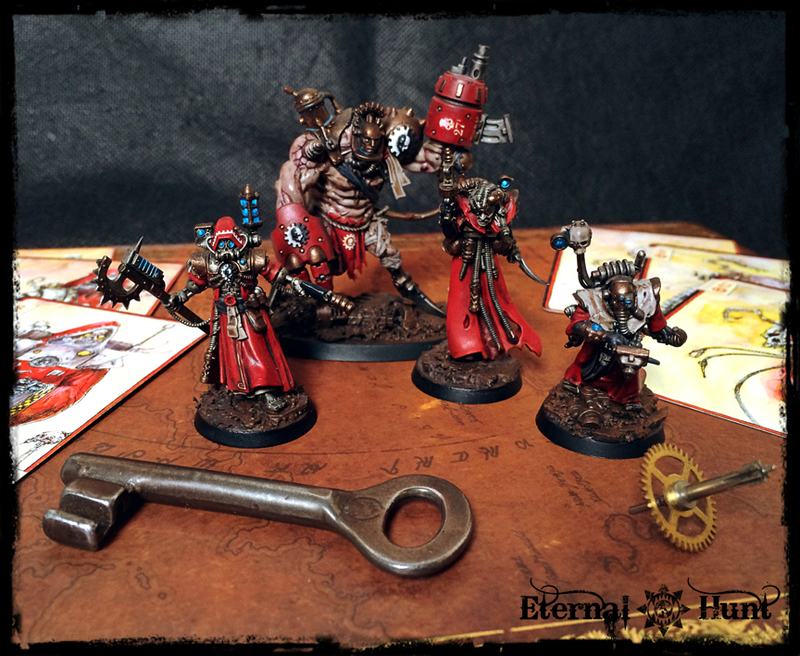 Korhold is thus governed by a council of senior Tech-Priests, yet the inherent factionalism of the Adeptus Mechanicus leads to frequent power struggles and politiicking within the priesthood. Magos Zoltan Phract, a rising star in the hierarchy of Korhold, in spite of his relative youth. Phract's coldly logical, some would say callous, actions during a worker's uprising on Silon Minoris, have earned him the notice of his peers. Genetor Karras Grendel, an eccentric member of the Organicist creed, fascinated with the possibilities and limits of the organic. A Datascryer, Korhold's own sect of information gatherers, the Datascyers's task is to delve deep into the datastreams, to cross-reference and spot hidden patterns or singularities. And to coax hidden meaning from the memory banks of ancient artefacts. Chimeric Servitor: Chimeric Servitors are the often eclectic, sometimes grotesque, creations of Genetor Grendel. Some of these creations are quickly abandoned, their aesthetic qualities incapable of holding the Genetor’s attention for long, while others may serve their master for years or even decades, repaired and reshaped time and time again to their creator’s needs. Karras Grendel is a true artist, and even among his colleagues, there are few who can understand his mercurial moods. 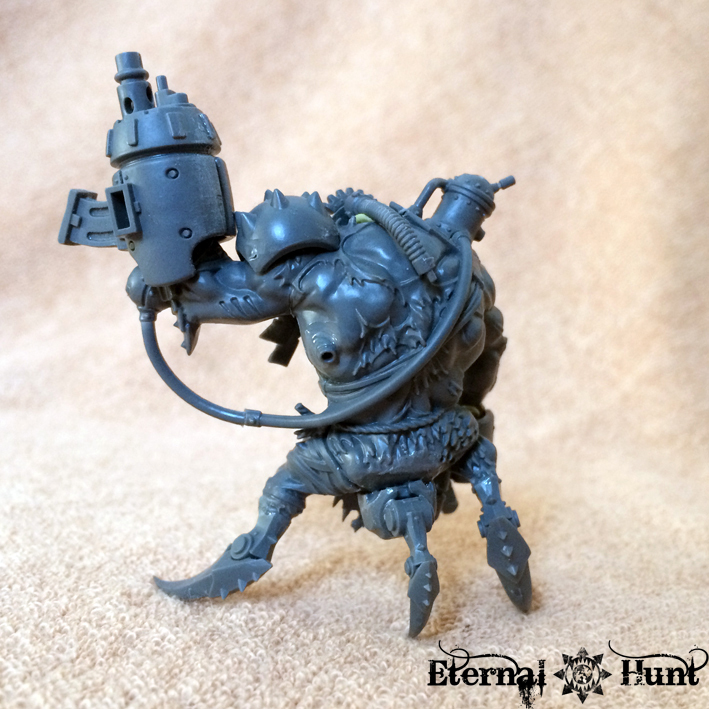 It's actually a fairly simple conversion, based on an - already pretty gross - Rat Ogre from the old WFB Blood Island starter box, with arms from the Kastelan Robots, a head from the BA Librarian Dread, and feet made from Heldrake claws. Where most of the Tech-Priests of Korhold favour fashioning their automata according to well-established and streamlined design templates, Genetor Grendel’s servants are invariably more artistic – and also far more grotesque – creations . For the Genetor is fascinated with the fusion of the organic and the mechanical, and so most of his so-called “Chimeric Servitors” are a seemingly haphazard exploration of those two materials, influenced by nothing more than the Genetor’s own aesthetic sensibilities. 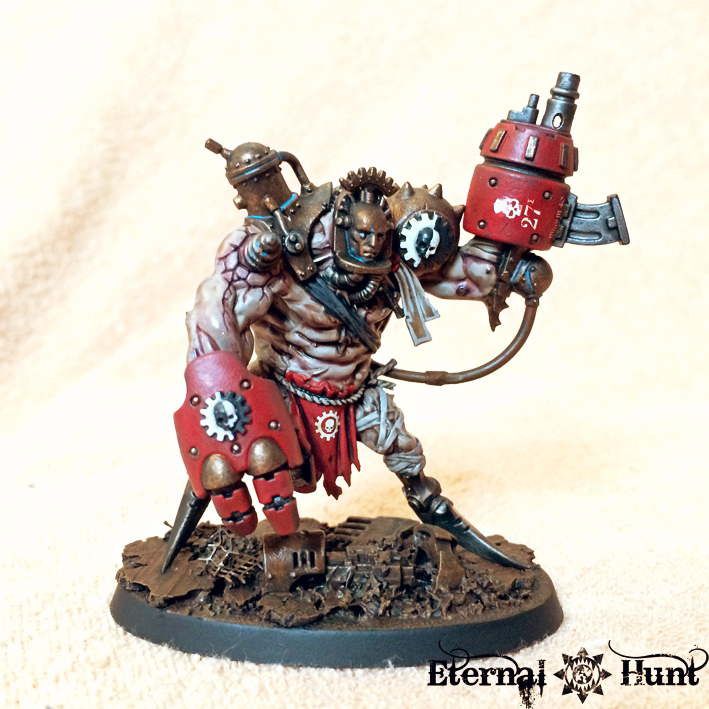 Most of them are lumbering brutes, their heavily muscled bodies crudely augmented with tools and weapons crafted from Mechanicum ingenuity. Beneath the multitude of implants and bionics, the provenience of the organic bodies used in these experiments is impossible to ascertain: Were they vat-grown for this purpose, or did they once belong to abhuman thralls or even to unfortunate humans? 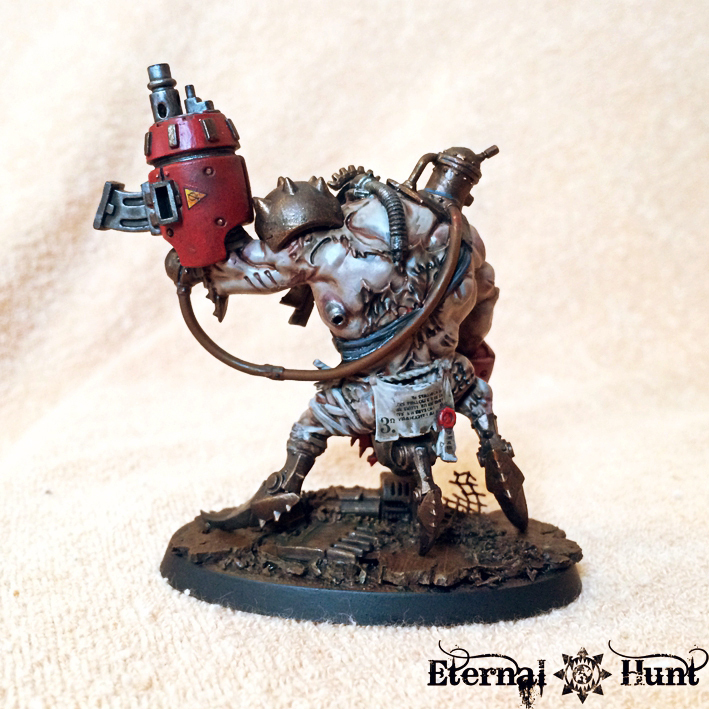 With the organic tissue grotesquely swollen and often covered in patches of bristly hair due to extensive genesplicing and hormone therapy, the organic parts of the Chimeric Servitors have grown so far removed from their origins that nobody can really tell where the Genetor procures his most valued specimens. Some of these creations are quickly abandoned, their aesthetic qualities incapable of holding the Genetor’s attention for long, while others may serve their master for years or even decades, repaired and reshaped time and time again to their creator’s needs. Karras Grendel is a true artist, and even among his colleagues, there are few who can understand his mercurial moods. Edited by KrautScientist, 13 January 2019 - 01:44 PM. 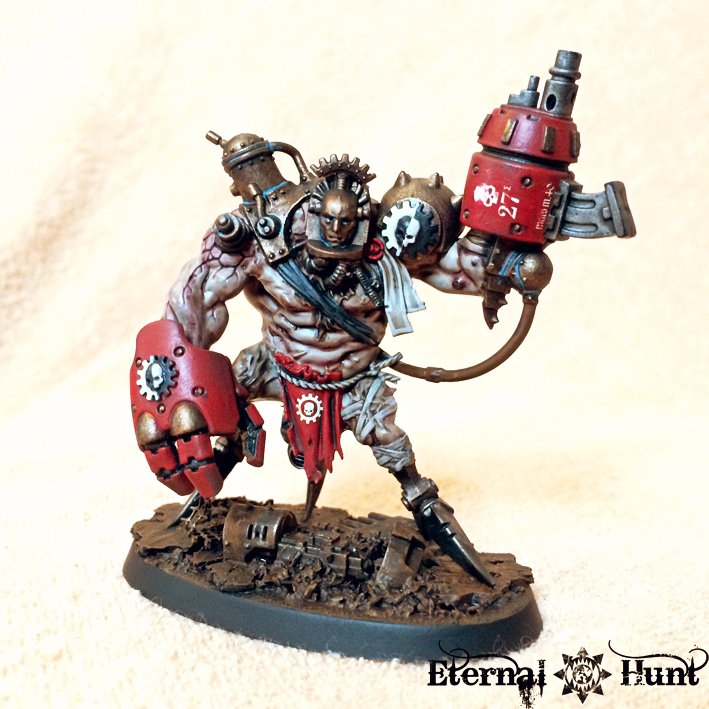 The chimeric servitor looks great! And that boys and girls is what happens when you skip leg day at the gym.